It's not just that Maggie misses her father, or understandably resents her new stepfather, Val. No, it goes beyond that: Val has too many shadows. Whenever Maggie looks at him, she sees him surrounded by wiggly shadow shapes with too many appendages. It can't be magic, because there is no magic in Newworld. Anyone with the potential for magic must have a procedure to snip the gene before they reach puberty, and even though Val is an immigrant, he wouldn't have been allowed in if he had any magic. Maggie tries not to think about it, and avoids Val as much as possible by throwing herself into her work at the local animal shelter, which isn't hard, since Maggie loves animals anyway. Then a cobey — a "coherence break" in the universe — opens nearby, and with one revelation after another, Maggie begins to discover that the world — and Newworld specifically — is full of surprises, among them that Val is not such a bad guy. When the situation goes from bad to worse, Maggie and her friends set out to set things right, accompanied by five very large dogs, a cantankerous Maine Coone cat, a friendly shadow named Hix, and one stubborn algebra book. 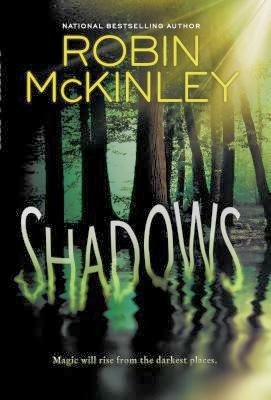 Shadows is a fun book with loads of teen appeal. Maggie's voice as the narrator is authentic and entertaining, if a bit rambly in parts, and there's gentle humor woven throughout the book. The pacing is excellent, perfectly balancing character development, excitement, humor, and reveals. All of the characters are interesting and well-developed, including animals, shadows, and semi-animate objects. Even the dogs each have distinctive personalities. Although Maggie finds she has some unusual abilities, she can't do it alone - it takes the combined efforts and abilities of everyone to succeed. There is romance, but it's not overdone and I like the direction that McKinley went with the it. There are dystopian elements, such as soldiers in the streets with scanners, roadblocks, and forced genetic manipulation, but I wouldn't call this a dystopian book. The focus is not on fighting against a dystopian government, although there is certainly some of that. Instead, it's more about finding yourself and discovering that the world is a different place than you thought. Shadows is a 2013 Cybils Awards Finalist in the YA Speculative Fiction category. Readers of both traditional fantasy and dystopian stories will enjoy this, as it has elements of both. Dog lovers, cat lovers, and origami artists will also find a lot to appreciate.